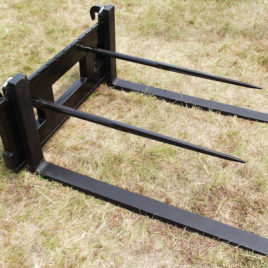 Pallet and bale forks are versatile tools. Thanks to the easy attachment and detachment of both forks and tines, they can be used for pallets and bales of straw, so-called "ballots". 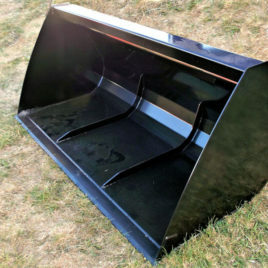 We manufacture a full range of buckets for loose materials. The casings are made of S355 high-grade steel sheets, and the blades are made of HARDOX wear-resistant steel. 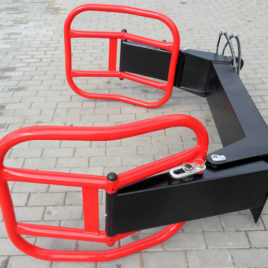 Shovels with width up to 2m, with a sturdy design, do not need inner reinforcement ribs. Designs with working widths exceeding 2m are further reinforced with 2 inner ribs. Individual types of shovels differ in working width (and therefore also capacity), the depth of the shovel bottom, and the type of mount. In our portfolio, we have two models of grapples for round bales - CB-120 and CB-120/1. The well chosen locations of the actuator mounting, and the rounded edges of the arms prevent film damage. 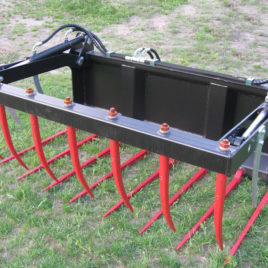 We manufacture "Krokodyl" manure and silage forks. They differ in working width (and therefore also capacity), and the type of tine in the upper arm (forged, welded). In the open position, the "Krokodyl" arm permits handling of bales up to 1.2 m in diameter; the arm is closed by two actuators. The whole structure is made of S355 high grade steel. Silage grapple buckets are used mostly in silage loading applications. 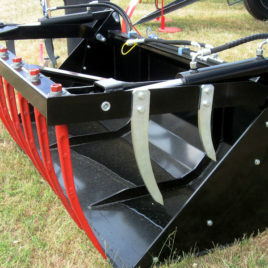 They can be also used with bales, compost, manure, branches, loose materials, and in municipal works. They are made of S355 high-grade steel, and the blades are made of HARDOX abrasion-resistant steel. Below a working width 2m, two swivel supports are used, and above 2m, three swivel supports are used. Our portfolio covers the full range of multi-purpose shovels, and their design combines the properties of shovels for loose materials and "Krokodyl" manure forks. With multi-function shovels, the blade is made of HARDOX abrasion-resistant steel, the casing of S355 high-grade steel, with arms that are closed with two actuators. 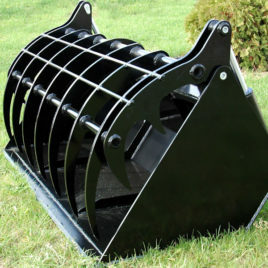 When fully open, the grapple bucket enables gripping of a standard bale with a 1.2 m diameter. Bolted sides expand the functionality of our buckets. Such a design of our multi-purpose shovels is useful in a number of farming applications, especially in loading of fodder trucks.